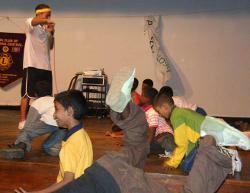 Break-dance show group ABCrew helped Projects Abroad to hold an ‘outreach session with a twist’ with the volunteers and children in Sri Lanka. The group from Switzerland taught everyone how to throw some amazing shapes in their usual enthusiastic manner. Our outreach sessions usually focus on an aspect of medical care or educate the children about various medical issues. However, this outreach session was about enjoyment and learning something new. An enormous thank you goes out to ABCrew for their generosity, and also to all those who attended.